Forgive me if some of this seems too simplistic and not as technically sharp as it could be; the aim is to give some basic working definitions to make sense of some of the things I describe in my posts. For a more extensive glossary on 3D see Lenny Lipton’s list and 3DGuy.tv’s list. 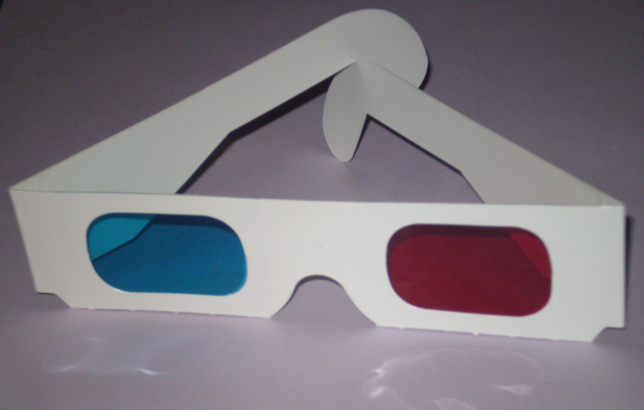 Anaglyph: is a way of achieving stereoscopic depth by using colour filters, usually red and cyan glassses. Depth Budget: The difference between the most extreme positive and negative parallax is known as the depth budget. 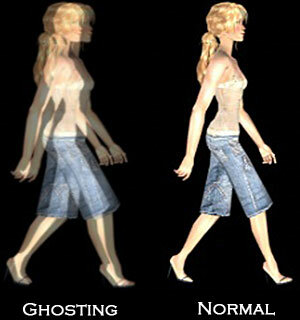 Ghosting: also known as cross-talk, happens when one image seems to leak into the other meaning that you can see parts of the image aimed for the left eye at the same time as the image aimed for the right eye. 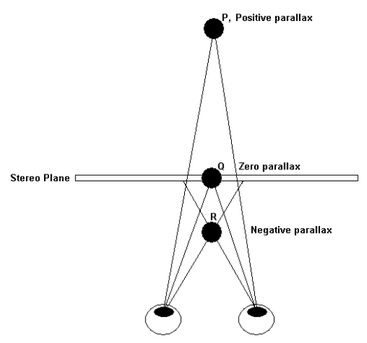 Negative Parallax: when objects in a 3D film seem to exist between you and the screen, they are in negative parallax. This effect is sometimes talked about as the emergence effect, pop out effect, bulge or protrusion. The inverse of this efffect is positive parallax. For more details check out here. Positive Parallax: when objects in a 3D film seem to exist behind the screen, they are in positive parallax. The inverse of this effect is negative parallax. Stereo-blindness: around 5-10% of the population are thought to experience stereo-blindness, meaning that they can perceive depth but not the binocular depth cues involved in stereoscopy. Stereoscopy: the production of stereoscopic depth, usually by presenting two different images for the left and right eye that are then fused by human sight to create one depth-rich image. This is often called 3D but that can be misleading as there are many ways of simulating three-dimensional depth but stereoscopic depth cues are unique to binocular vision. Strobing: also know as motion judder is an effect that is also visible in 2D cinema, particularly early cinema that was shot at less than 24 frames per second. When there is fast motion the individual frames of the film don’t quite keep up meaning that viewers experience a flicker-like strobing effect when looking at the action. 3D filmmaking often enhances the strobing effect.